Occasionally an app will need to run some code at regular intervals, why? Maybe generate a data stream, plot mathematical sequences, read data from external feeds, poll a resource or external device, simulate machines or processes etc. For some financial, engineering and scientific applications the time interval required may be very small. For Windows PC .NET apps (WinForms) there is the Timer class that generates events at the millisecond level (thousandths of a second). However, what about faster events, down to microseconds (millionths of a second). Since modern CPU's are multi-core, hyper-threaded, and GHz beasts, then raw speed is not an issue. How can code be run every few microseconds? This article provides a Tick class that can call code at intervals as low as a few microseconds, useful for running high speed regular executing code. Issues can arise when streaming events at high speed, including updating the user interface (UI) and processing all the raised events. These issues are addressed in this tutorial. The C# Stopwatch is the .NET class used for high speed timing via the Windows high-resolution performance counter, see C# High Resolution Timer. Depending upon the processor speed (see the table in the linked article for examples), the resolution can be as low as a few hundred nanoseconds. This means the Stopwatch can be used to time very small intervals. Timing down to few microseconds is well within the Stopwatch range on modern PCs. This means that code that can be executed in the order of tens of microseconds can be called at regular intervals by running the Stopwatch on a background Thread, and using its timings to trigger a regular event. This article provides example code to demonstrate that ability. In Visual Studio start with a new WinForms project, here called TickerDemo. A new class library project is added to the solution to hold the Stopwatch that will run in the background. The class library project is called Ticker. The class in the new Ticker project is renamed from Class1 to Tick. This separate class library allows the Tick class to be easily used in other projects. That is the start of the Tick class that will be developed in the rest of the article. For this tutorial the Tick class is going to fire a stream of high frequency events. Each event is going to be used to roll a dice (OK die, but most people say dice). The dice rolls will be summed and the average value will be calculated. For a six sided dice the average value of all rolls should come to 3.5 (1+2+3+4+5+6=21, 21/6=3.5). This is not a difficult task and could be done easily in other ways. However, here a dice simulator is used to illustrate the generation of high frequency events. The final app will be able to run many thousands of dice rolls per second. To show how CPU speed affects the code execution speed a dice rolls per second calculation will be performed. This will allow the apps performance to be measured on different PCs with different CPUs. Because the dice simulator performs thousands of rolls per second the UI cannot be updated on each roll. There would not be enough time to update the UI before the next roll value became available. The number of the rolls would quickly increase faster that the screen could be updated, quickly hanging the PC app. Therefore, the UI is updated every few hundredths of a second. This is fine for the user as it is in the range of normal human visual response times. 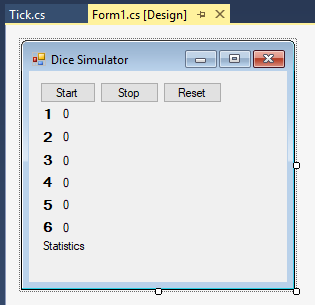 To achieve this the dice roll statistics are processed on a normal WinForms timer. Drop a Timer from the toolbox onto Form1, call it TmrScreenUpdate. Set an appropriate Interval, e.g. 100 (100 milliseconds, or one tenth of a second). Depending upon the CPU the faster the ticker runs the more likely the UI thread cannot keep up. On a system with an Intel i7-4770 3.4 Ghz processor the Microseconds value could be set to 5. The simulator calculated it was running 98 thousand dice rolls per second! 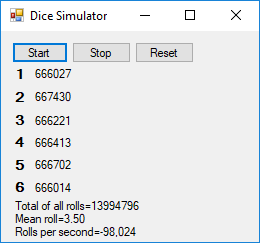 This compares to one thousands dice rolls per second if the simulator used a standard WinForms Timer component to perform the roll. For a full list of the articles on Tek Eye see the website's index.